It’s time again to shine the spotlight on the amazing Celebrants out there, those awesome people whose passion for helping couples celebrate their love, knows no bounds. Today we’re zooming in on fabulous Cornish Celebrant, Nicola Le Couteur Bisson who probably has the most glamorous name for a Celebrant ever! Nicola shares with us her top tips for couples getting married, and we find out what she likes doing when she’s not at weddings and in the midst of all of her ceremonial preparations in and around Cornwall, home to some of the UK’s most stunning beaches and landscapes. What made you become a Celebrant? Having worked for Cornwall Registration Service for nearly 20 years before being made redundant I knew there was a call for more bespoke ceremonies. We were always being asked if we could conduct ceremonies on the beach or in a garden. I loved being part of couples journey towards the wedding day, but as a Superintendent Registrar there was only so much I could do to personalise the ceremony and process for them. I took my redundancy and made it into an opportunity to continue doing what I love, and enhance what I am able to do for each couple to make their wedding an unforgettable, magical experience. Is there anything about your previous job/career/life experiences that is relevant to you being a Celebrant or helps you now as a Celebrant? I have always been interested in people and training, I find people endlessly fascinating so my jobs have always been people focused. My trainer training was brilliant and dealt with aspects of psychology and it gave me experience of dealing with a wide range of people from national and regional managers to clerical workers. The training also gave me a wide variety of skills in delivery techniques which has proved invaluable. The skills learnt in my earlier career have been so helpful in my celebrancy practice. What has been the highlight of your wedding career so far? 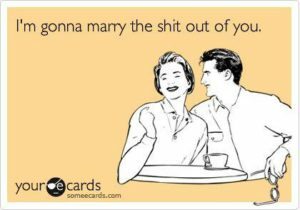 When couples say “can we really do that” when we discuss their ideas and vision for the ceremony and then to see their joy as they say their vows in the ceremony they have dreamed of having. What advice would you give to couples getting married now? What mistakes could they do with avoiding? Think about what you want out of the ceremony and the day – what is most important to you – organise that first. Remember that the wedding day is just that – a day – it’s the start of a life together, be inventive and creative rather than spending loads of money, it’s so much more fun! What has being a wedding Celebrant taught you about life and people? 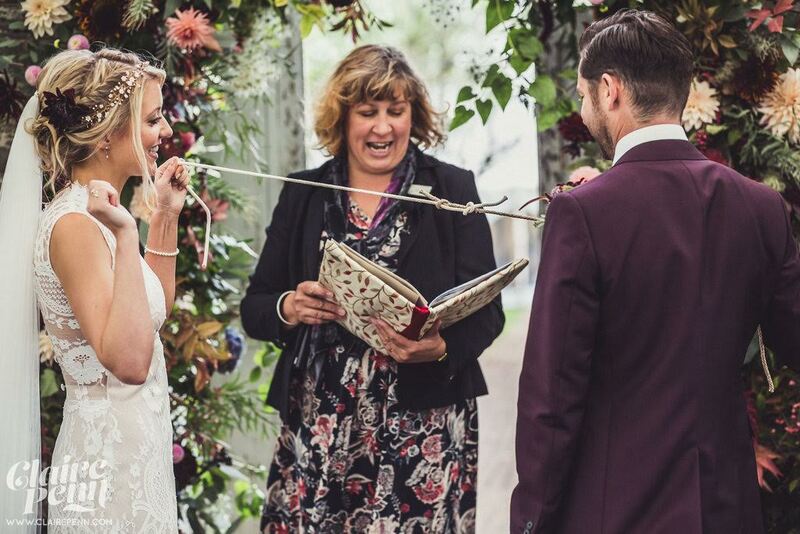 What do you love about being a wedding Celebrant? Being able to help a couples vision become a reality. What aspect of your job as a wedding Celebrant gives you the most satisfaction? Knowing that I have helped each couple have the ceremony they have dreamed of having. What are your favourite types of wedding ceremonies? I love the outdoor laid back ceremonies, ones that are true to the couple. What’s your favourite symbolic ritual, and why? I love “tying the knot” – it is such a visual symbol of the couple coming together, and a lot of fun! If you could sum yourself up in three words, what would they be? What would be a dream ceremony for you? I have had most types of ceremony, but would love to have a couple adventurous enough to get married as the sea actually laps at their feet! How would you say the wedding industry has changed in the last fifteen years? There is far more choice, but also far more pressure to put on a “show” and the expense that that incurs. Celebrant weddings are now a popular and growing choice for couples seeking to have a bespoke ceremony. What kind of couples do you enjoy working with? Its always nice to work with couples who have an idea of what their wedding ceremony should be like. What are your favourite types of venues/spaces for weddings? This is difficult to answer – I love it when the wedding venue/space is fully in tune with the couple and we are immersed in the space. The one where the bride forgot the handfasting wrap (even though I had checked with her just before the ceremony started that it was in the right place). We ended up using her father’s tie! She saw the funny side at the end and thanked me for being resourceful! When you’re not busy being a Celebrant what do you love doing? Walking my two dogs on the beach, reading, and baking. Nicola makes up one half of www.cornishcelebrants.co.uk, with her business partner Denise Whitehair. If you’re getting married and you fancy a Cornish celebration, make sure to check them out.